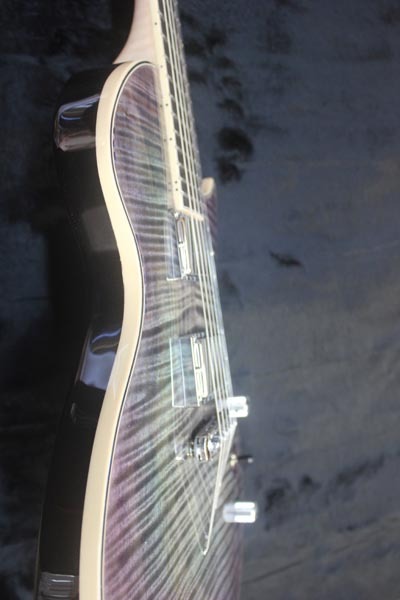 The guitars must play well, sound fantastic and look stunning. 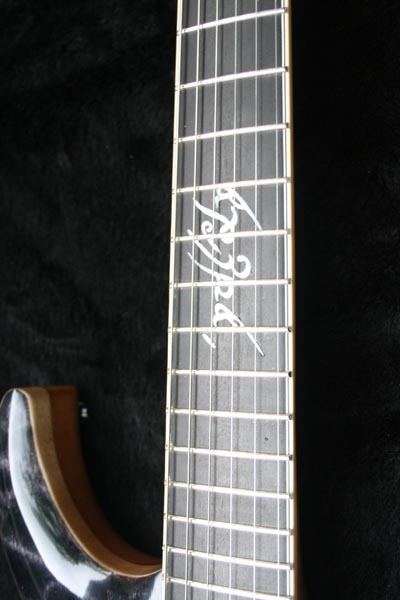 This credo is the paramount philosophy of Crossley Guitars. 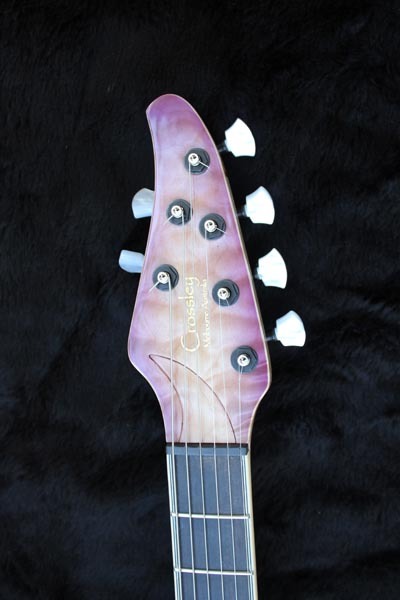 Our challenge to you the customer is to try these fine instruments and compare them with what you are playing now, we believe that with your input, your Crossley Guitar will take you down a path of enjoyment and satisfaction not possible on a factory produced instrument made by machines. 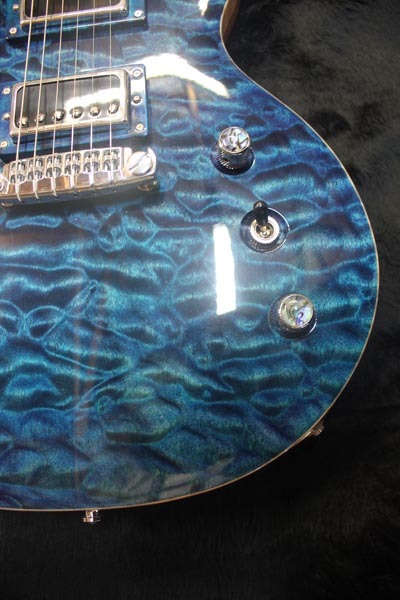 We pride ourselves in our customer involvement, it's your guitar, it needs your input. Like most musicians Peter Crossley started playing guitar in his early teens, and has continued to the present day. Peter had always modified his guitars to make them play better, improve the sound and make the guitar a transparent conduit between the musician and the music. This led to the inevitable desire to build his own instrument. The success of this first project led inevitably to the construction of others. 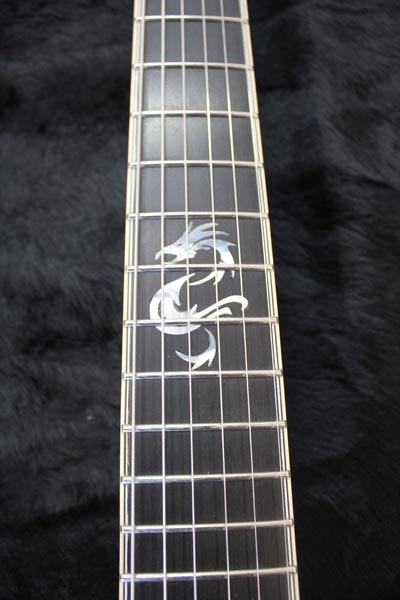 A definite style and philosophy was developed, leading to the guitars now offered by Crossley guitars. 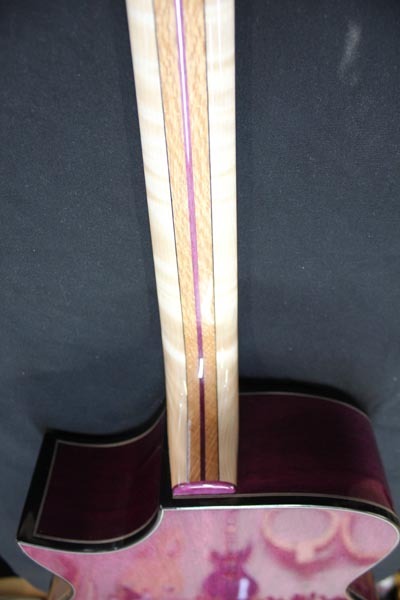 Peter is always trying to improve on the design and aesthetics of the guitars, which has led to many innovations including, but not limited to the development of a 22.5 degree neck join, instead of the traditional 90 degrees and removal of the guitars heel, allowing free access to the 24th fret. Experimentation with stains and spray techniques has led to the array of palette choices available. All Crossley Guitars are built to be strong, light, resonant and alive, creating instruments that you will treasure for a lifetime. 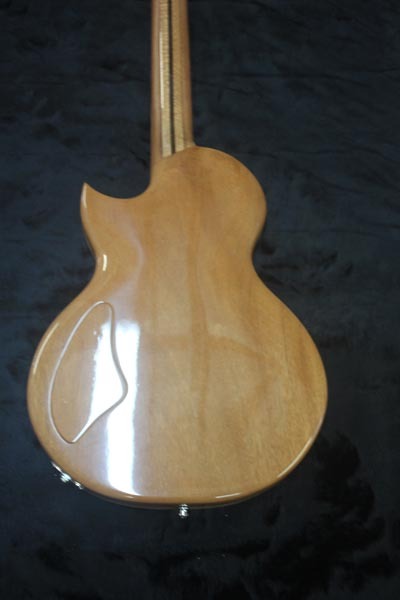 Crossley Guitars can design and build for you at a fair price that custom guitar that you have always wanted. We may share your relevant information with hosting service providers and/or other reputable vendors for the purpose of production or maintence of your websites. Your information will not be shared for any other purpose and will be kept secured. We cannot ensure that all of your private communications and other personally identifiable information will never be disclosed in ways not otherwise described in this Privacy Statement. For example, we may be required to disclose information to the government or third parties under certain circumstances, or third parties may unlawfully intercept or access transmissions or private communications. We can (and you authorise us to) disclose any information about you to law enforcement or other government officials as we, in our sole discretion, believe necessary or appropriate in connection with an investigation of fraud, intellectual property infringements, or other activity that may be illegal or may expose us to legal liability. My name is Richard Lundmark, Sweden. I was performing at NAMM this year, and I went to visit Michael Ibrahim and MI Audio as I was interested in the Tube Zone pedal (after having extensive mail contact with Brett Garsed about it). When over at their booth I also got the chance to try out their new amazing amp, and one of the guitars I used to try it out was made by you. 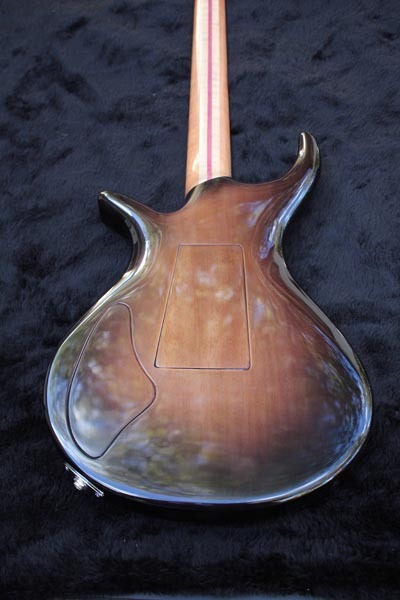 It had a natural finish, apparently a prototype of sorts according to Michael, with a hollow-chambered design. (but jugding form your website, I guess it was a "P" series?) Really loved the shape and feel of it too! Just wanted to let you know that I really loved that guitar! 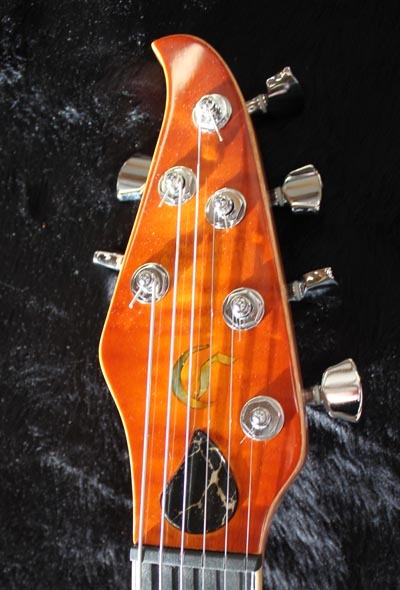 The lightness and chambered design brought both attack and punch to the tone, and the consitency and sustain of the neck was amazing. This particular guitar was setup with rather slinky strings and super-low action, which is far from my desired set-up (which usually surpises people that hear/see me play lol). But never-the less, the tone and playability came through loud and clear. I got a card of yours from Michael, and just thought I'd email you my appreciation for your work, 'cause excellent craftmanship deserves every bit of recognition! 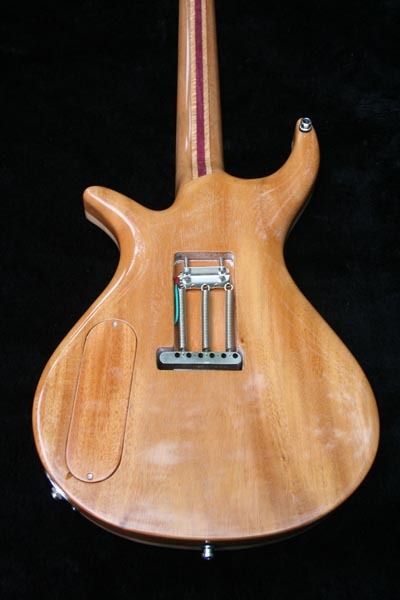 I will definatly save your card, until such time as I can afford one of your builds ;) The chambered/light design is really up my alley, and that transparency is something I have become used to with my Flaxwood guitars, and it was really good to find those same qualities in a hand-buildt guitar! 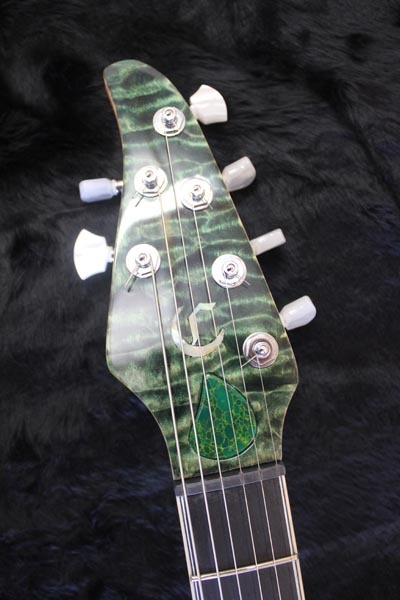 I first heard of Crossley Guitars while surfing the web. 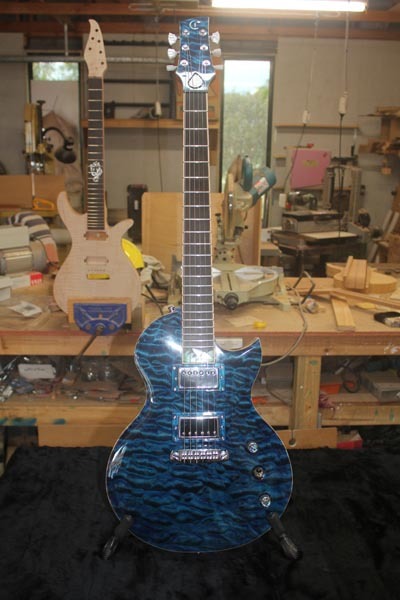 I got to Peter's website and was very impressed with the guitars he had built. 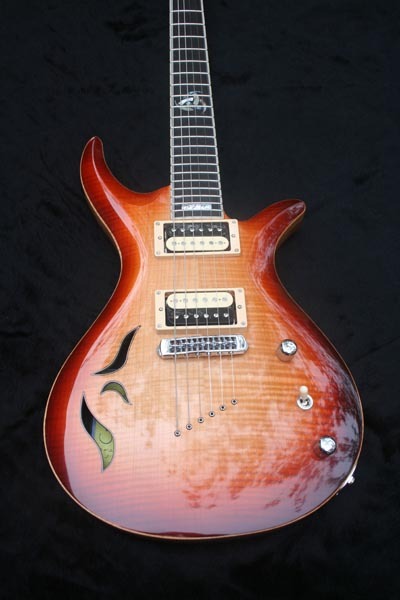 I had never been able to find exactly what I wanted in any of the machine made, mass produced guitars on the market, and all the custom guitars I had previously seen were well out of my price range. 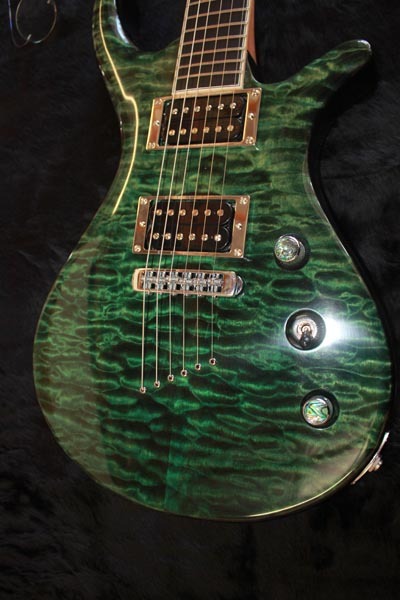 Peter would be able to build a hand made custom guitar with all the things that I wanted in it, at an amazing price. When I first went over to Peter's place to check out his guitars it was obvious, from the first strum, that these were quality instruments. The necks felt like silk and the tones were immaculate. 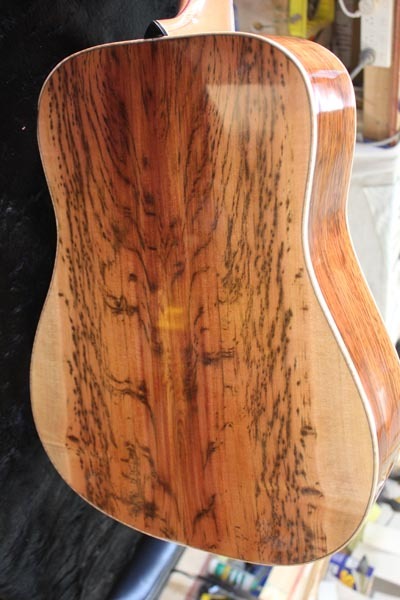 The top of my guitar is a lovely flamed piece of English Sycamore, the back is an insanely gorgeous piece of African Rosewood. 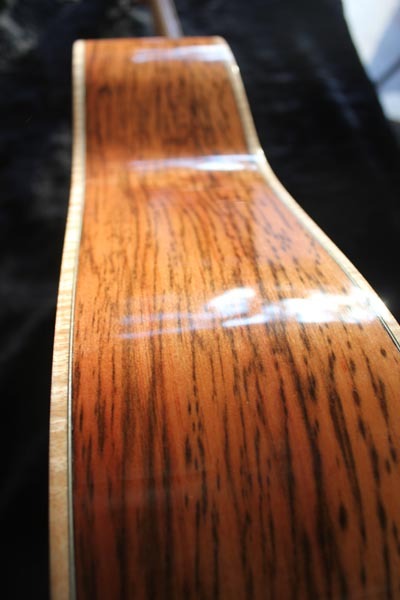 The neck is Queensland Maple which has an incredibly hypnotic, shimmering flame all the way along it. 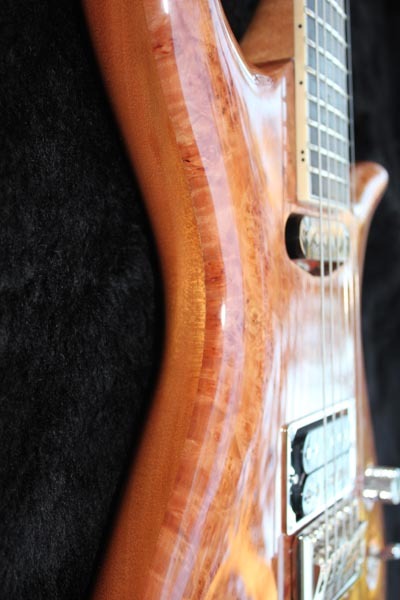 This has to be the best looking single piece Queensland Maple neck in existence. 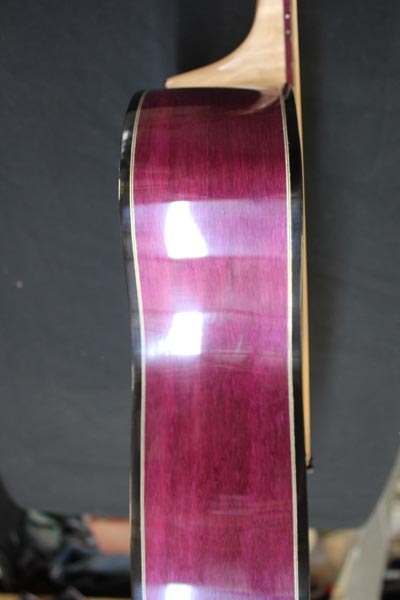 Fingerboard is a beautiful piece of Ebony with just the right amount of the natural purplish, pinkish striping. Two Seymour Duncan pickups - Pearly Gates in the neck and an SH-5 in the bridge. These two pickups are an excellent combination. 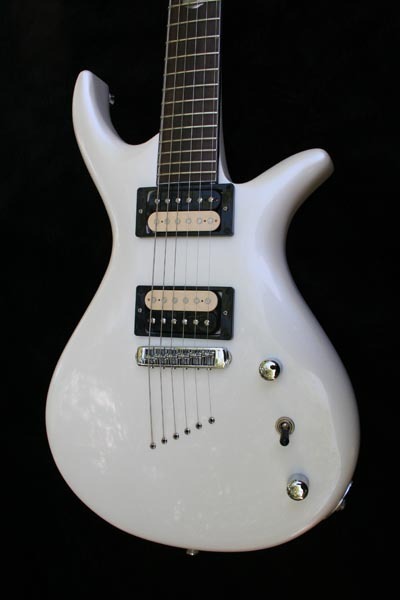 It has one volume knob and one tone knob with a 3-way pickup selector switch. I had Pete install a mini switch to do the coil splitting so that I could have that option independent to the main switching system. This gives 6 different tones. Pete has recently been placing the coil splitting switches on both the volume and tone knobs which gives you 8 different tones and allows you to combine Humbucker and single coil sounds. Brilliant. I m thinking about modding mine to this and having the mini switch control something else. The experience of being involved in the build process was incredibly educational and immensely enjoyable. 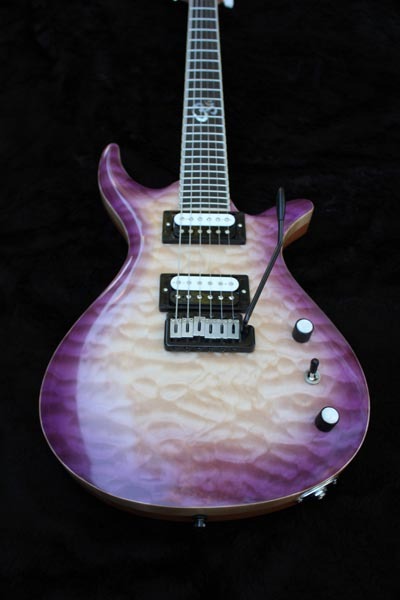 Pete is very knowledgeable about build design, tone timbers and guitar hardware. 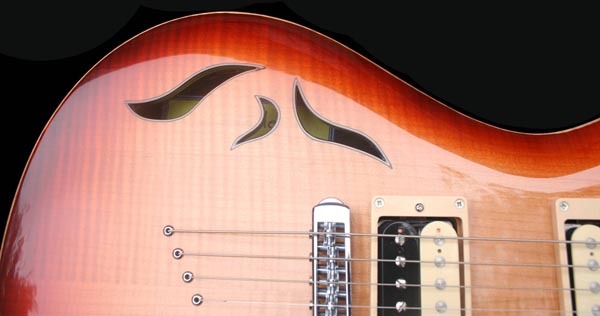 I have been to one of the two major guitar manufacturer's factories in the US and let me tell you right now, those guitars have not got the soul and spirit that a Crossley Custom has. They might develop some spirit through the hands of the right player, but on there own they weren't built with the love that mine was built with. I think that is a massive difference. From the initial selection of timbers, Pete was always so helpful in giving the insight needed to make an informed decision about all the different aspects of the guitar. 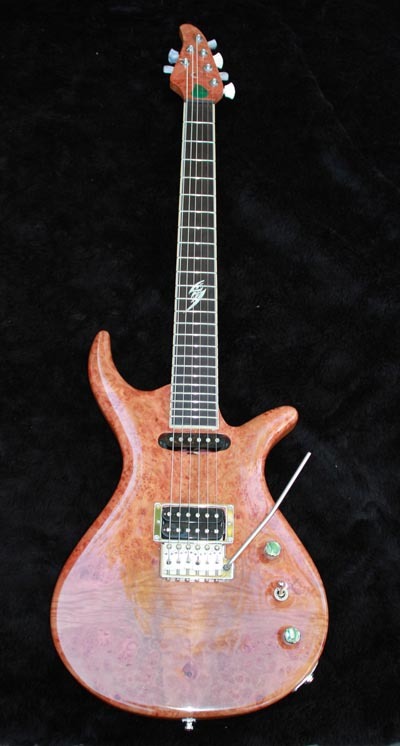 After all, this was a custom guitar from the ground up and absolutely everything needs to be accounted for. We went through every single aspect of the guitar, the materials, pickup selection, pickup placement, neck angle, bridge height, control knob placement, the list goes on and on. It s quite amazing the amount of things that go into building a guitar! 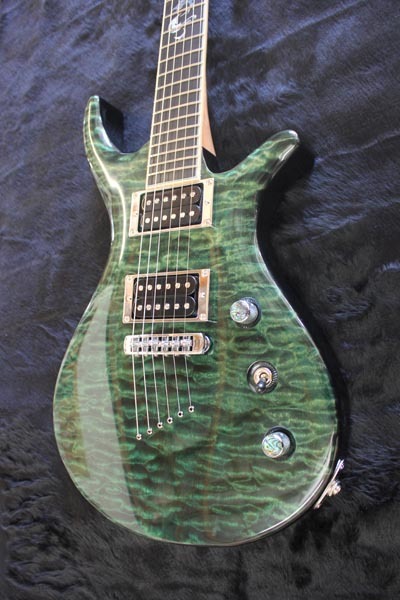 He was also aware of my playing style and tone production and took that into account in his recommendations for various materials and hardware. The neck of the guitar is where you really get personal. This is the main area where you come together with the instrument and let it be an extension of your mind's ear. This is probably the most crucial area of any guitar. One of the first things I noticed about Pete's guitars was that his neck joined the body very smoothly without a massive block in the palm of your hand as you reached up to the higher frets. 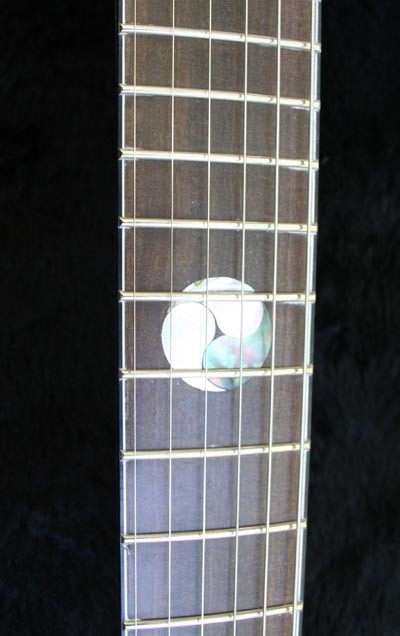 You can sit up at the 22nd fret and there is absolutely no restriction of any kind. Sensational. During the build I was experiencing some RSI (repetitive strain injury) in my left wrist. This has been a recurring problem for the last 10 years but it was quite severe this time. 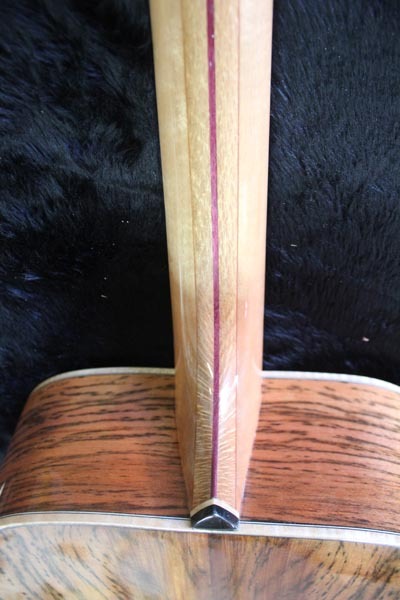 I asked Pete about this and whether there was something in the design of the neck that can help with this issue. Pete wasn t sure at the time but told me he would think about it. He did some research and found that having a flat profile on the back of the neck can sometimes help with these problems. He decided he would design a neck with this principal in mind. I'm very glad he did. 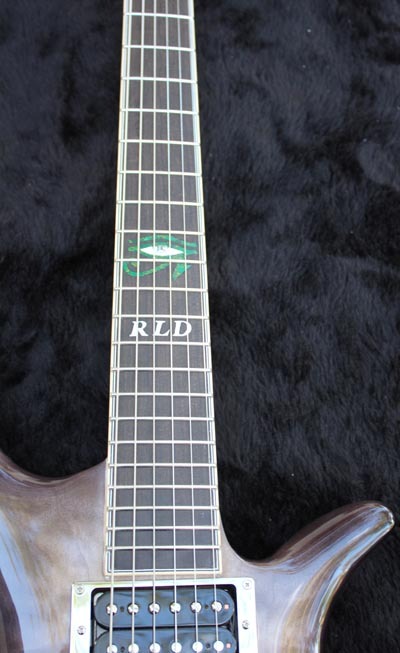 The design of this neck has helped the RSI a great deal. 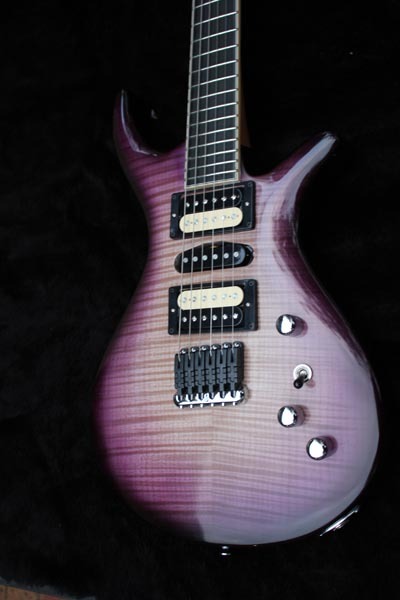 It is an incredibly comfortable guitar to play. I think this displays Pete s outstanding customer service and attention to detail in providing the best for his customers. Pete has continued to refine his flat back neck design and it has crept into some of his new guitars and they all feel sensational. I am incredibly happy that I decided to get Pete to build me a guitar. 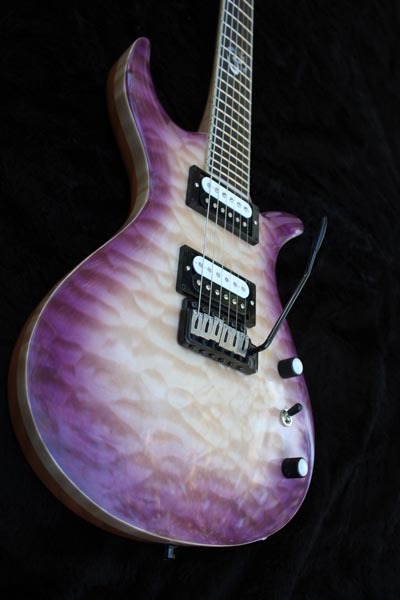 It is a unique instrument amongst a vast mass of virtually identical production guitars. It is a wonderful extension of my mind s ear and I am recommending that every guitarist in the world experience a guitar that has been built for them by Peter Crossley. 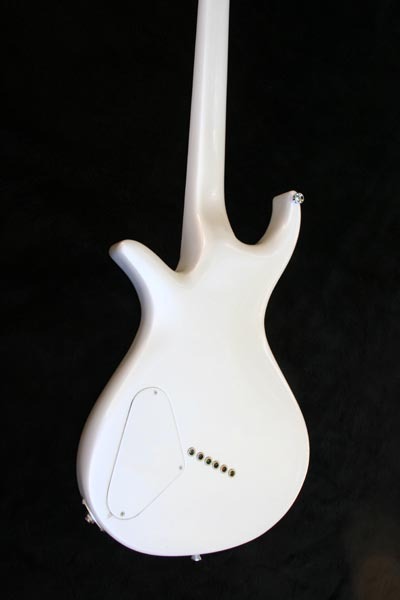 The first thing you notice about this guitar is how light it is when you pull it out of its fitted case. It weighs bugger all The next thing you notice is the way it feels so comfortable in your hands. Its hard to put into words but the guitar just sits where it should in the ideal position and screams PLAY ME!! When standing it repeats this amazing feat and sits beautifully on the strap. 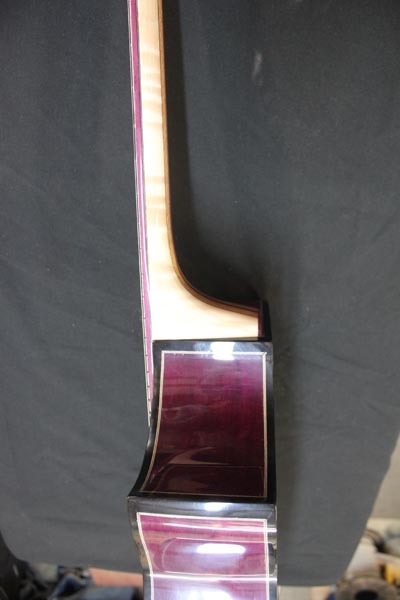 While I am no lead player the neck is simply stunning, scale runs turn to liquid tones easily. there is no stretching to reach and it makes it easy to finger chords and bends are a snap. 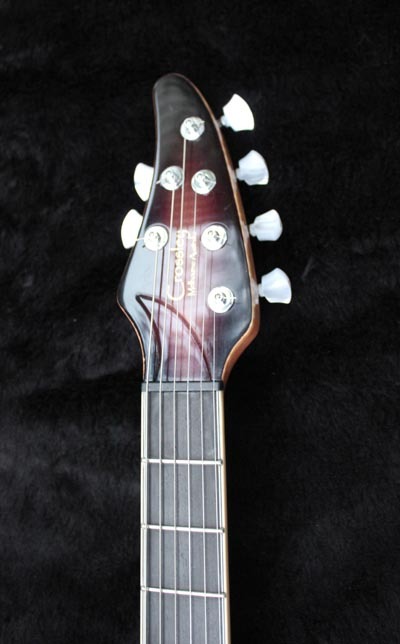 The neck is faster than any Ibanez Gem or its ilk for me. 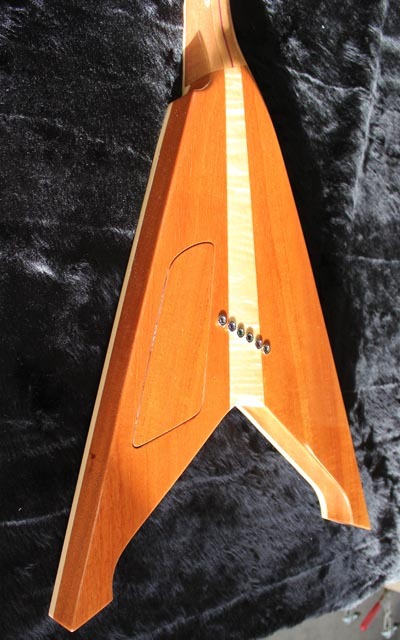 The neck and comfort are a strong part of the design ethic , Pete has built this guitar for players, not wanker collectors. The small body feels so comfortable and the lower bout, that I didn't like 12 months ago and now love, locks the guitar into your leg. 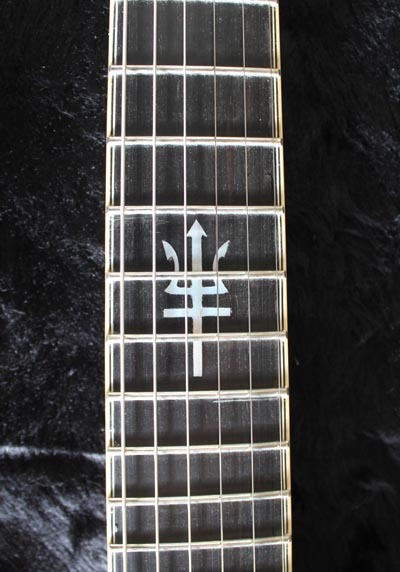 One last thing here, the guitar looks very different up close!! 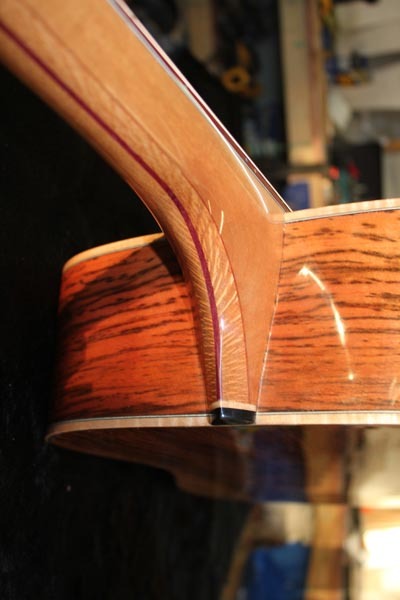 Here is where the guitar really shines. OK, first the confession. 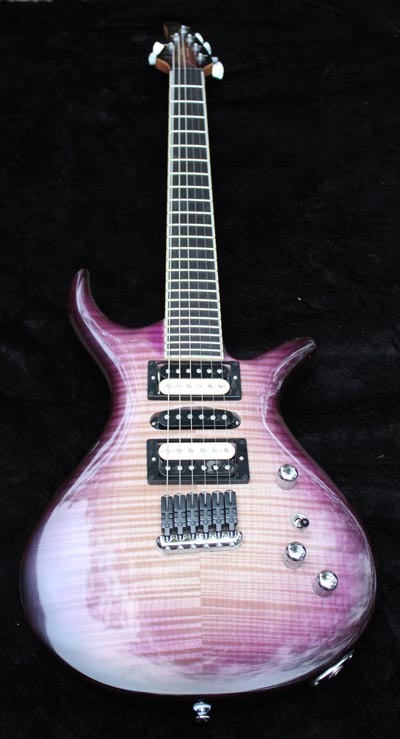 I didn't need a new guitar, and convinced myself that I would sell 3-4 other ones to fund the Crossley. Time will tell! 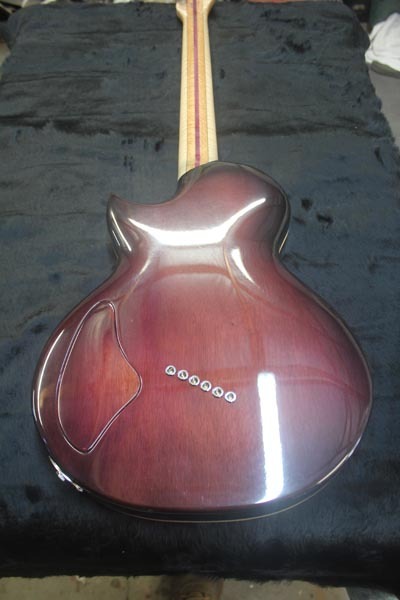 I started thinking about getting a guitar built that met all my needs, and posted a few messages to get some feedback on the forum. 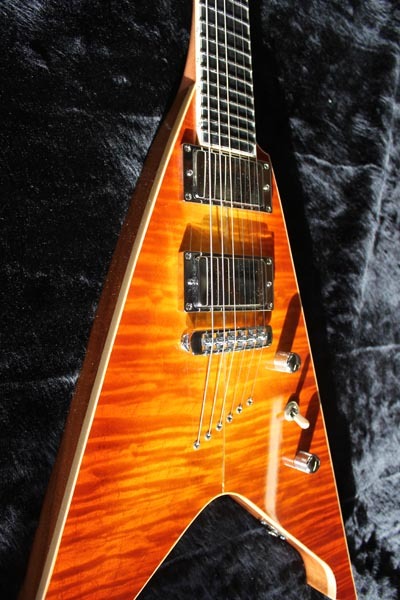 Essentially, my criteria was a guitar that was light, had a great neck, was a bit different, had a trem and splittable humbuckers and Aussie made. Whilst I wasn t quite sure about the shape of the Crossley P series, I dropped over to see Pete and fell in love with his guitars. We then set about modifying the standard specs to meet my criteria. So, it took a couple of months to build, but time seemed to fly, as Pete would EMAIL photos on a regular basis, and make contact often to discuss options as the guitar progresses. When Pete and I discussed the guitar, I didn't want to deviate from the original P series too much, as I didn't want to pay $$$ for R&D and then find it didn't work out. I have a custom guitar from the 80s that I can't play (hate it) and can't sell (hate it more!!!!). 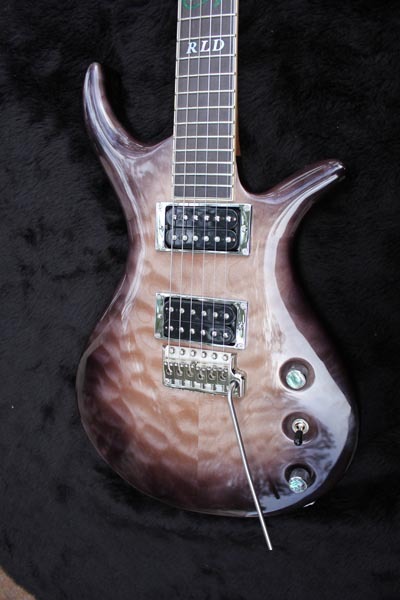 So we decided to use the P series shape, but go with timbers that suit my requirements, add a trem and Mick B pickups. I used the guitar for the first time last night, and took along a couple of other guitars just in case. Didn't pick up another guitar for the night! The Neck - Pete's necks are awesome. Consistent, comfortable, great neck join (both looks and feel) and low action. 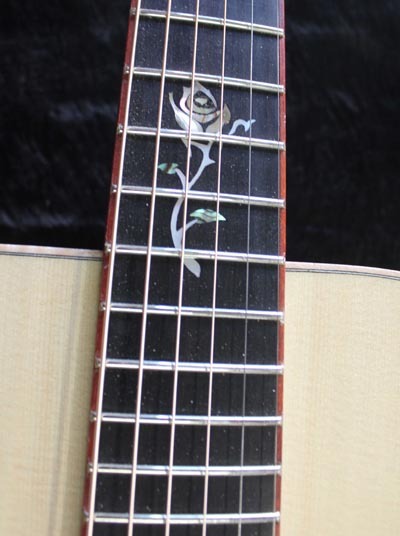 The inlays are superb. I decided not to go with the butterflies, and the falling leaves look tremendous. The laminated timber looks sensational. I like large necks, and the Crossley is not that, but there is something very special about it. The Weight / Body - mine is hollow (chambered). 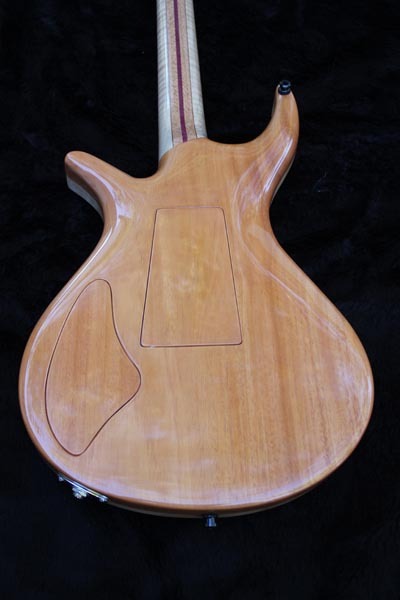 It has a mahogany back, quilted maple top and laminated neck that looks superb. My favourite guitar is a Gibson Firebird Studio, but I can't manage the weight for 3-4 sets. The weight of the Crossley is light, well balanced, well contoured and cosy. Quite a small body. I didn't want another Fender, Gibson or PRS imitation!!!! Looks MUCH better in the flesh than in photos. I have not played a more comfortable guitar live. The Sound - punchy, full, nice tops, and the split coils almost sound like a tele. Just what I wanted. It is never going to sound as big as the Firebird, but it is close, which is surprising given the size of the body. Mick's pickups are very articulate, and the split coil sounds are the best I have heard. The Trem - stays in pretty good tune for a non locking system. 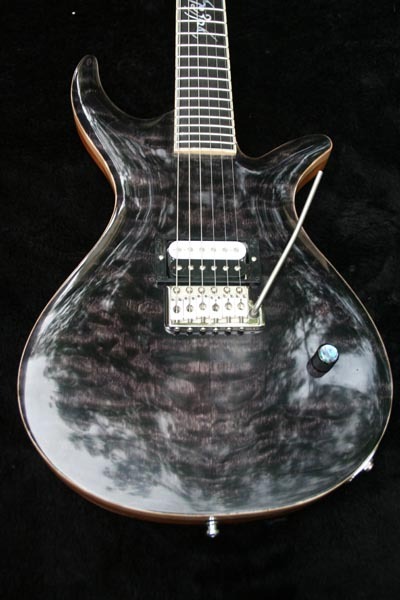 Similar to a PRS. Pete hates them, but persevere with him folks!!!!! I am using a Hipshot Tremsetter for extra stability, and it works very well. The Finish - looks more aqua than blue, but I love it. The flame is really bold, and the grain glows on the guitar. It looks like a custom, rather than a mass produced lifeless axe. The nitro finish is great glossy, and I m sure will age well to a vintage look. The Service - just call Pete folks. 50% of buying this guitar was the experience, making the decisions with Pete, getting regular EMAILS with build photos, and being indecisive!!!! Pete is flexible, provides great guidance, and really wants to make sure you are happy. I love to talk guitars, and Pete is a great bloke. Don't tell Pete, this, but I would have paid 50% of the price for the experience. He also has a lovely wife, who seems to understand his obsession. I also talked pickups with Mick B, and his service is extraordinary. I love this guitar, and can picture myself playing it for many years to come. 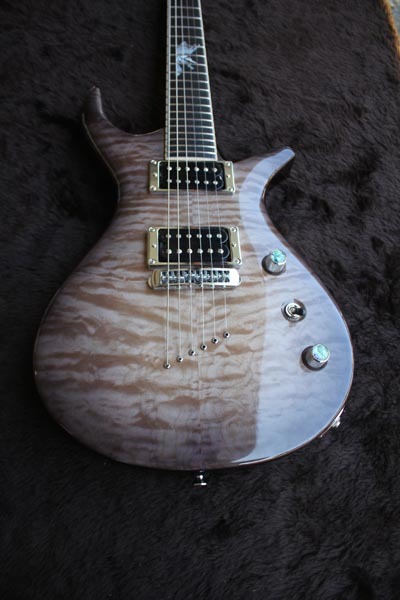 It would be a good alternative to something like the PRS Custom Series, but seems to have more character in the sound, and has better playability. 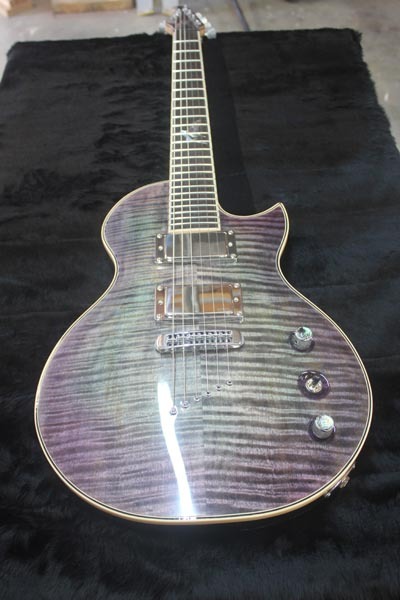 For around $3K (or a bit more for my options), it is a great deal for a high-end custom guitar. 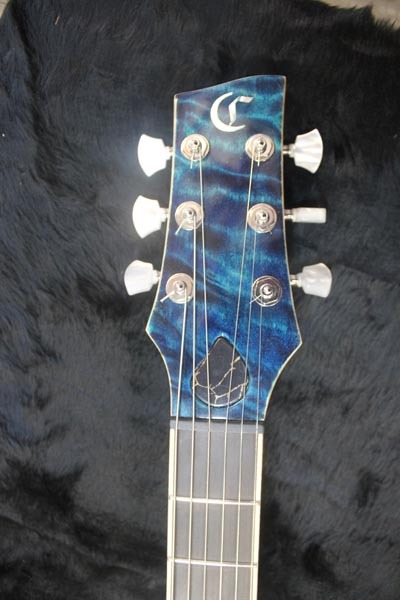 Recieved my very own Crossley custom series guitar today. Arrived in 2 days from Melbourne to Sydney packaged as if it was going to be dropped form a 20th story window. 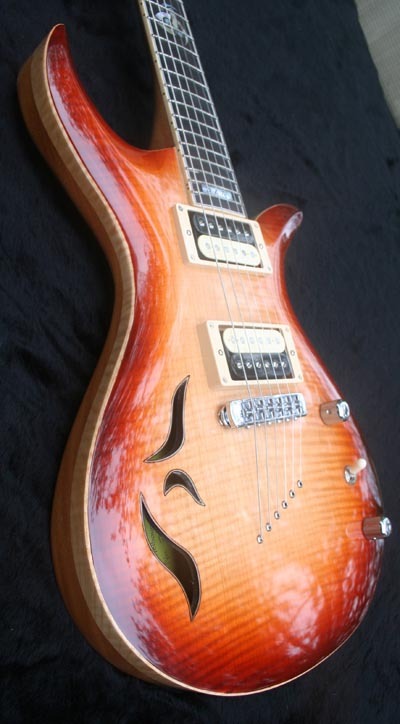 Its the third of Petes custom line, the guitar is beyond words, it has a nitro finish, really sets the flamed sycamore cap off giving it that trippy3 dimensional look. 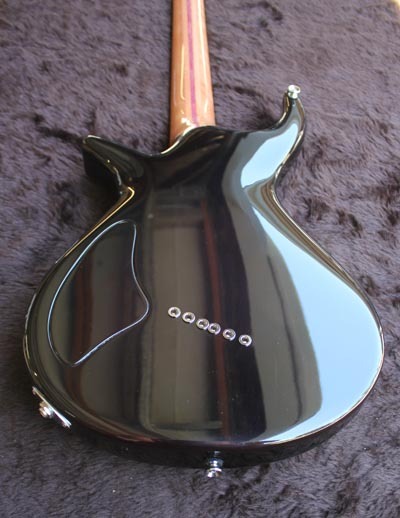 Its neck is smooth and fast with a huge amount of access to the upper frets. The contour of the heel lets your hand come right up into the cutaways while still providing ample movement to your fingers. 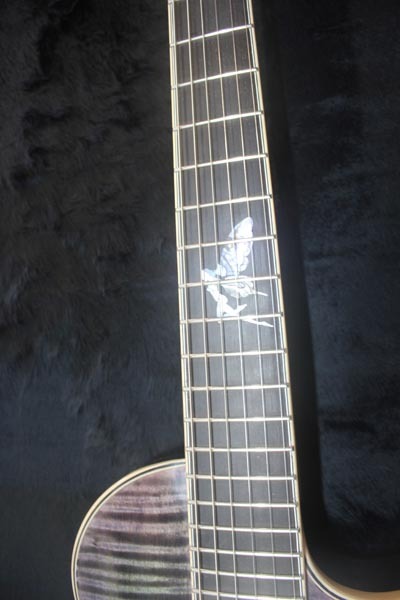 The butterfly inlays are flawless all the way down the fretboard and the sperzel locking tuners and fixed bridge provide great stability and tuning. Plugged in theres plenty of sounds to be had. Fitted with 2 seymour duncans and a five way toggle you can get the 3 normal humbucker positions plus a split bridge or split bridge+split neck. (les,tele or strat) Petes fitted it with a volume and tone control, each providing a perfect roll off without any loss in prescence. The guitar is very warm sounding with a crisp and even mix across all the strings. The amount of options is great for me because I like a lot of styles. I can play my blues with the two split humbuckers but change straight back to the bridge humbucker which has plenty of punch for heavier rock riffs. 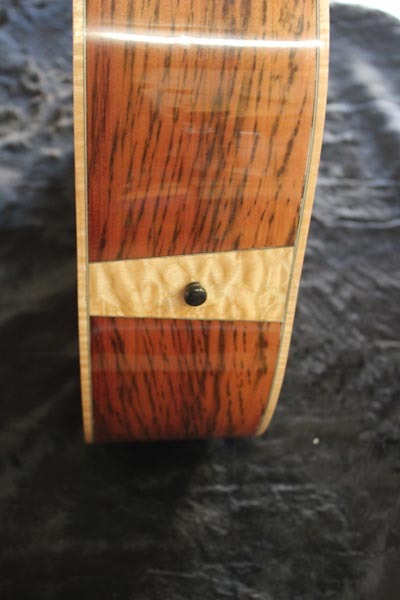 The guitar also came in its own custom fitted hardcase which completely blew me away. From speaking to Pete he's certainly taken the approach that everything he's always hated about guitar designs has been completely left out of his guitars. As hes mentioned to me its been built in 2007, so it doesn't have 1950's technology. The pots are wired to "actually work" as he put it. I own quite a few guitars most of which I payed a lot more for, and now I can finally sit back and ask myself why? 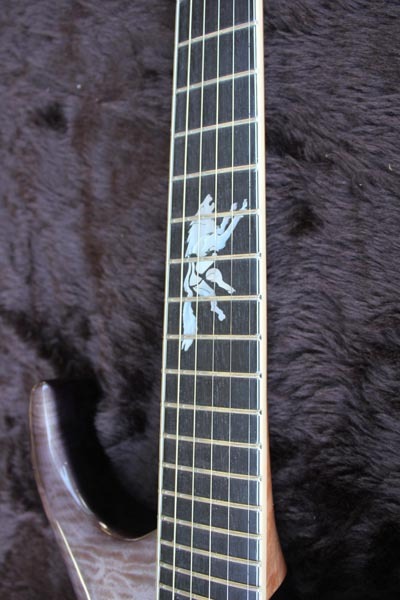 After purchasing this hand built guitar made in Melbourne for what I'd consider an obscenely low price I'm converted and will never buy outside Australia again. 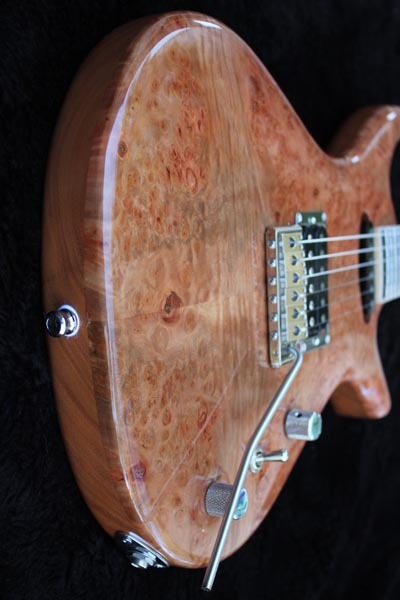 I'd highly reccomend anyone interested give Pete a call, I have found him to be friendly, honest and very passionate about guitar making and I'm sure with guitars and customer service like he has provided to me, his business will thrive. Speaking of wood, and your exotic choice selection... In some African communities there is a great belief in Nyama, an energy and power present in all things of nature. It's similar to the soul, but much more universal than such. It is 'magical' to these peoples. There are only a few certain people born with the inherent ability to mold, or work with Nyama and with that use it to create art which is highly praised amongst them all socially. They are very respecful of their artists. 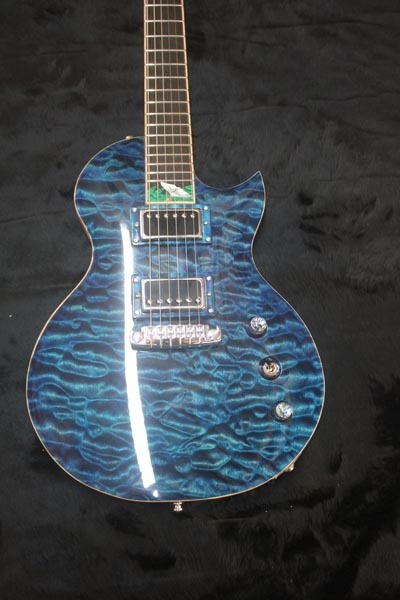 If you were to present this guitar to them, no telling what your response would be. SO with that extra tid bit of information, you may have created a guitar, but not just any guitar but a guitar that transcends all guitars. Nice piece of art, as well as an instrument. 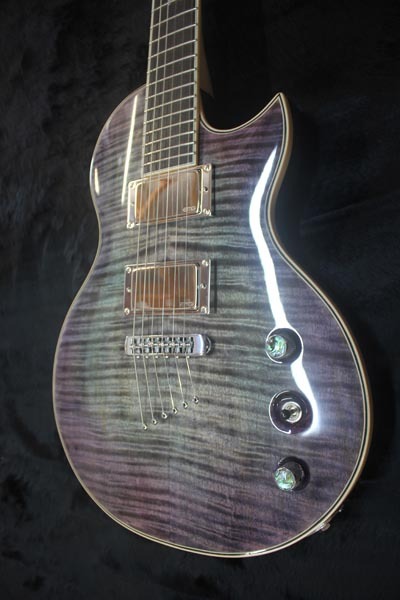 T-4 Crossley Custom Series I apologise for taking so long to post this review for Pete's awesome guitar, but finally here it is: This guitar arrived to me with no delay and packaged extremely well to avoid any damage over the trip. 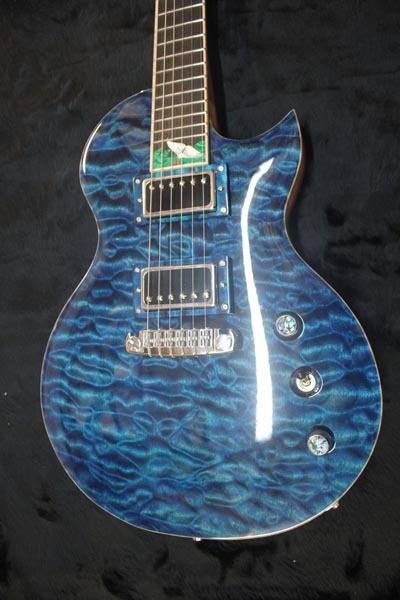 I wasted no time in plugging it in and giving it a run, the look and feel of it in the flesh was of the upmost quality and you could see that it was made with no detail spared; from the graphite tuning pegs, to the Paua shell triangle inlays on the fretboard which add to the originality of the guitar, the seymour Duncan pickups which provide a crisp clean sound or beefy rock sound when you crank the distortion while maintaining great sustain, complete with the 5 way toggle switch which gives you access to variety of sounds to play with, brass volume and tone knobs and Schaller Roller Bridge. 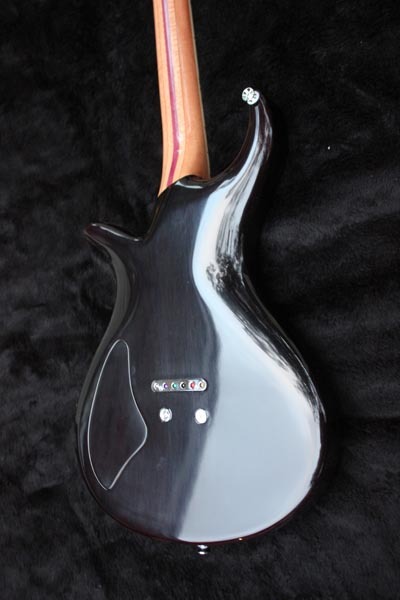 The guitar is coated in an attractive high gloss nitro finish which makes this guitar shine and stand out from the rest. The custom made case for the guitar just completes the package and makes it a keeper. Both are proudly Hand Made in our workshop located in Metung, Victoria using only the finest tone timbers and hardware available. 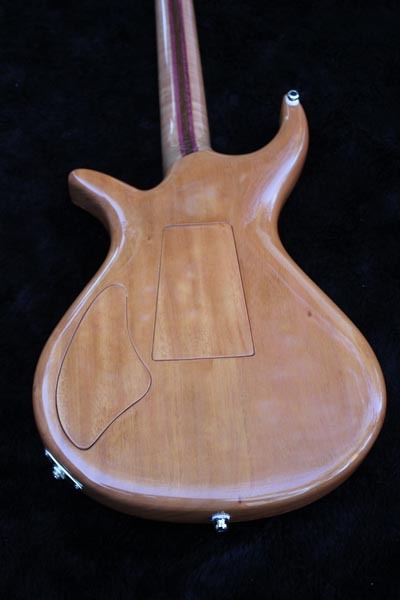 550 years old Mahogany body. 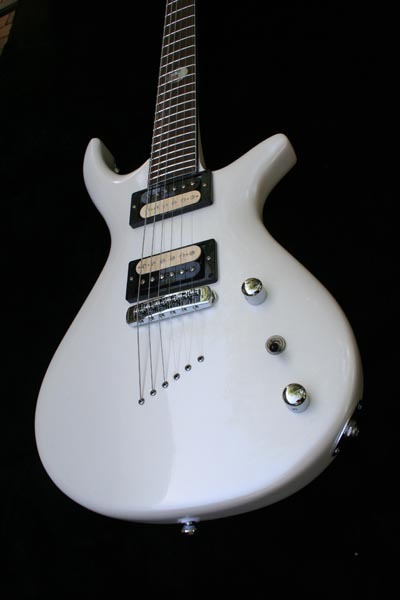 Prices for Crossley Custom Electric Guitars start at $3,800 AUD, for a fully hand made guitar. Compare this pricing with the popular brands, remembering that they are made primarily on machines. 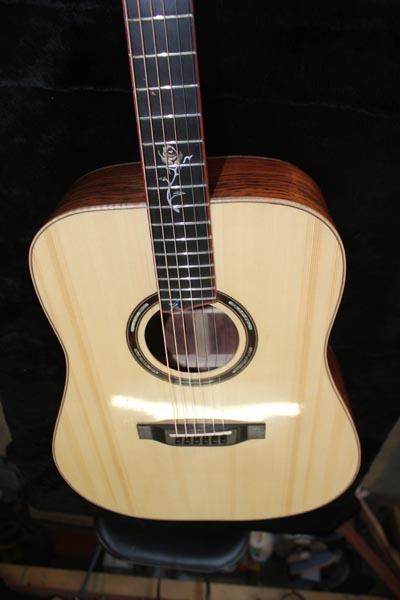 Prices for Crossley Custom Acoustic Guitars start at $4,800 AUD, these are also fully hand made guitars and finished. 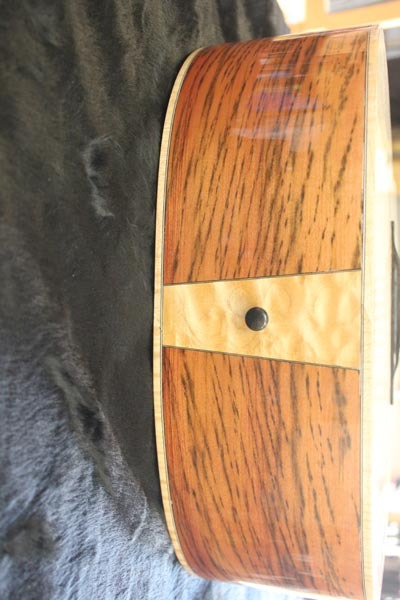 Custom Designs for both acoustic and electric will generally be quoted within 1-2 days, and we know the pricing will be lower than you would expect. 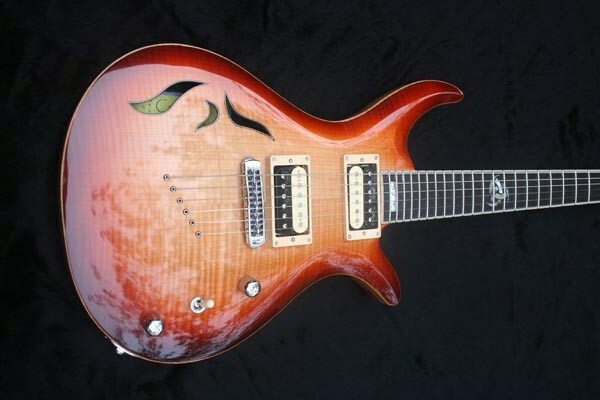 If you have ever had the dream, call us at Crossley Guitars and talk. We love to talk about guitars, we love to play guitars and we love to see you playing them.